You have to hand it to those sadistic Scandis: they love cranking up the gore in their TV crime shows. So, each season of The Bridge has opened with a gruesome discovery, including a corpse comprising the top half of a politician and the bottom half of a prostitute, or a crashed boat full of pneumonic plague victims. For this fourth and final Bridge, they've gone one step further with Margrethe Thormod, the general director of Copenhagen's Migration Agency, being stoned to death. The big question is who was behind this atrocity? Perhaps it was the gay Iranian dissident whose case led to the 'champagne scandal' when immigration officers were filmed popping bubbly after confirming his deportation back to the Middle East and certain persecution? Or was it the work of the mysterious Red October, who are either a rogue left-wing group or massive fans of Sean Connery? Maybe the taxi driver who picked Margrethe up just prior to her murder or even her grieving husband may know a little more than they're letting on? For anyone who has followed The Bridge so far, chances are we haven't even met or heard of the true perpetrators. For many viewers, the show's drama exists largely among the key players and the fates that await them during this final stretch of eight episodes. 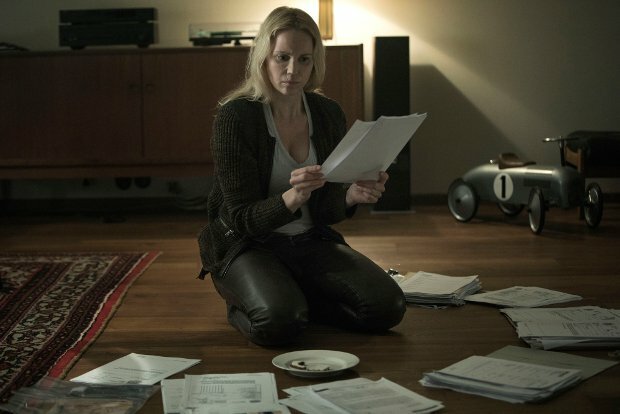 Saga (Sofia Helin) opens the series in prison awaiting new evidence to clear her of her mother's murder while her former cop partner Henrik (Thure Lindhardt) is anxious to have Saga back on the streets so she can help trace his two daughters who have been missing for eight years now. With Saga initially out of the game, Henrik is paired up with Jonas, played by Mikael Birkkjǣr who was previously Birgitte Nyborg's husband Philip in Borgen and Sara Lund's rogue partner Ulrik Strange in The Killing. Here, his quasi-Saga aloofness accompanied by an array of inappropriate comments is a direct contrast to Henrik who positively drips with empathy. When Jonas attempts to commiserate with Margrethe's husband, his words are as hollow as the talk in Choir of Young Believers' theme tune. One other constant pleasure in all these Scandi dramas has been learning which words echo their English translation: so here, 'quickie' is the same while 'sofa bed' is 'bed sofa'. Given how many major characters get mercilessly treated in the these kind of shows, we shouldn't keep anything crossed too hard for a happy ending to the Saga and Henrik story. But it is surely going to be glorious if gory fun getting there. Episodes watched: one and two of eight. The Bridge Series 4 starts on BBC Two, Friday 11 May, 9pm.